Apple, Antivirus, Bitdefender. Is your Apple Mac safe? Please read this article and give this some serious thought. Before we go further into this article, if you bought your self a nice brand-new car, would you put free or second-hand tires on it? Of course, you wouldn’t, particularly if it was an expensive model, it wouldn’t be very safe or secure! So why would you trust anything but the best Antivirus on your Computer, particularly if you are depending on it for your business? To start with a few points. If the Mac is impervious to viruses or malware, why are Antivirus companies spending their money on R&D to build Antivirus Software for Apple Macs if it will never be required? As Apple Mac products become even more popular, the world of virus creators are seeing a whole new world of new possibilities. Particularly while the people of this world believe they do not require Antivirus. Pictured below is a Macbook Air that came into our workshop with all sorts of issues, that looked just like virus activity. 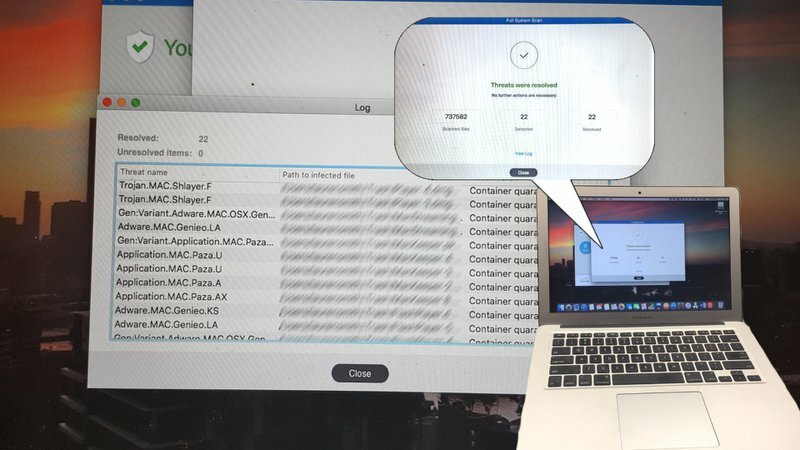 We loaded our Number One Antivirus Bitdefender, on the Macbook, and it found a couple of thousand infiltrated files. The picture below is the second run to clean up, of which it found a further 22, and you can see how many different viruses there are already written specifically for Mac’s. Zero-day or unknown malware routinely eludes traditional Antivirus/Anti-malware defences. These cyber-attacks disrupt businesses, costing them time and money and compromising sensitive data. By their very nature, Antivirus signatures cannot stop unknown threats. New and established security vendors claim their ‘next-generation’ solutions use signature-less detection based on revolutionary technologies like machine learning to catch zero-days. Despite the alluring stories and buzzwords, the efficiency of these solutions is anecdotal and rarely backed by trustworthy independent sources. Unlike alternative solutions, Bitdefender consistently proves the efficiency of its signature-less technologies in the most important independent tests, blocking 99% of zero-day threats in the AV-Comparatives heuristic/behavioral trials. Besides achieving the best detection rates against zero-day threats, Bitdefender also routinely scores the lowest number of false positives. Bitdefender is the one We would be recommending for your Mac or PC Computer. Have you heard of Managed Antivirus? This takes it another step forward for the end user. This is where Managed Services and Antivirus collide. A managed Antivirus is where the Antivirus is managed and monitored by your IT Support Team. This is how IT Support Companies can give you a complete all-rounded Proactive and preventative IT Support, versus reactive or Ad-hoc IT Support. With a Managed Antivirus, the Antivirus software reports back to a central dashboard 24/7. This Dashboard is monitored by the IT Support Companies Technicians, looking for any anomalies or errors that the Antivirus might occur, such as, can’t download the latest set of virus definitions or program updates. The Antivirus software has an issue with either quarantining or removing a virus. Etc. etc. Remembering, no matter how good your Antivirus rates or it said to be, it is still just a piece of software, and can have issues from time to time. But this is one piece of software you do not want to ignore if it is having problems. Call us today for a no obligation frank and upfront chat about the Antivirus Software you are or are not currently using today. PreviousPrevious post:Are you backing up your Data? If not, why not?